21 Mutinies is an intriguing, pirate-themed game. Each turn, one player is the captain and they declare which of the various actions they are going to carry out. 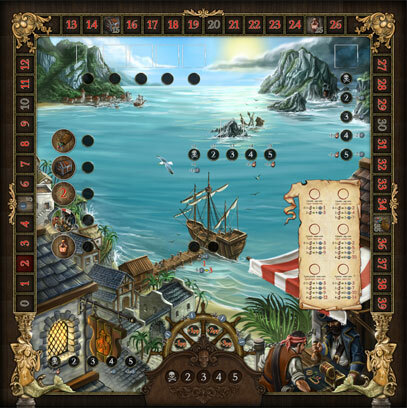 Then, in order, players choose whether to do the action the captain is doing or they can perform the cabin action or mutiny. Tavern – Receive a share of rum but the amount to be shared is randomised after picking the action – first-come, first-served. Black market – Sell combinations of jewels for doubloons and prestige points. Town – Gain one of various benefits like gain rum, buy prestige points, etc.